Imagine if you could explore the universe at your leisure. Where would you go? How would you leave your mark? One Elite: Dangerous player decided to draw the game’s logo across the infinite night. It took him a month. Elite: Dangerous is massive. Thanks to procedural generation rooted in actual scientific principles, the multiplayer space sim has over 400 billion star systems. It’s unlikely that players will ever explore all of them. 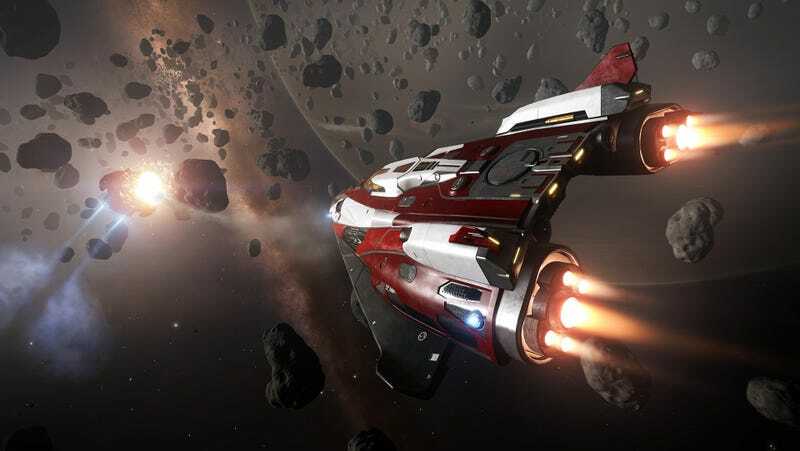 As a result, players really can venture to places nobody’s ever visited before—and make in-game cash in the process thanks to the game’s planetary scanning system. Commander Malibu is a player who just clocked his 2,000th hour in the game. It probably won’t surprise you to hear that he enjoys exploring. It’s pretty much all he did for a year, documenting his progress in a series of time-lapses so chill that they deserve to be on Toonami circa the late ‘90s. One of Commander Malibu’s previous time-lapses. Later, he gravitated towards other wholesome, family friendly pursuits like bounty hunting and piracy. But he recently began to once again yearn for the open stars. There was just one problem: he didn’t know where to go. “I already visited a lot of marvelous places such as nebulae, black holes, planetary features, shiny rings,” Commander Malibu said in a DM. Elite’s logo is pretty intricate, especially if we’re talking about things you’re planning to paint atop thousands of light-years of the endless cosmos. Malibu had no idea how long his gargantuan undertaking would take him. He just knew that he was gonna do it—and that he had to be very, very precise or else he’d wreck his entire drawing. He plotted his route using Excel spreadsheets, the free Photoshop-alike GIMP, and “a bit of mathematics.” He departed Elite’s inhabited area on March 23. Commander Malibu doesn’t have an idea in mind yet for his next big Elite project, but at this point, the sky’s the limit—and Elite’s sky is basically unlimited.